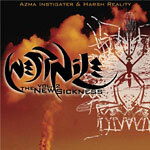 Azma the Instigator and Harsh Reality of the Inthevisualz return with a follow up and a hefty amount of battle-worthy rhymes and heavy beats for West Nile 2. With appearances by Adept Poetik, Stigma.One and production by Gammaray, DJ Abzorb, Harsh himself and more! Tracks 1 and 8 Produced by Gregory B. of Mafioso Ent. & Chasm. Tracks 2,.3,4 and 22 Produced by DJ Abzorb. Tracks 5,7,12,15,16,17,18,20,21 and 25 Produced by Bobby Lo. 6 by Heron Traxx for Rufnek Ent. Tracks 11 and 19 Produced by Gammaray. Tracks 9,10,13,14,23 and 24 Produced by Harsh Reality. Executive Produced by Azma the Instigater and Harsh Reality. Cuts on tracks 4,8,17 and 22 by DJ Slow, with cuts on track 15 by DJ Abzorb. Graff by Stigma One. Design by Tib.